Last year was challenging for investment managers. Equities did well in the first nine months of the year, then headed south – particularly in December. 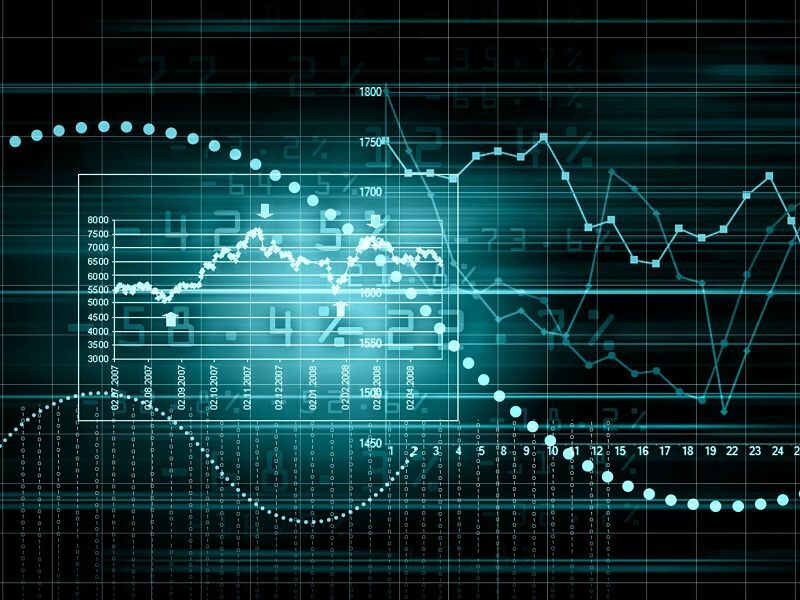 Interest rates rose, but backtracked a little as the year drew to a close. The result was money being pulled out of markets, which “sapped speculation,” Moroz adds, and didn’t produce enough volatility to generate investment opportunities. Volatility did increase, however, later in 2018. RBC’s fund family, which is the largest in Canada with over $300 billion in long-term AUM as of Dec. 31, did quite well last year, although its percentage of long-term AUM in the top two quartiles, 58.1%, is well below the top performers. Other fund families that did very well in 2018 were those of Fidelity Investments Canada ULC and Beutel Goodman & Co. Ltd., the portfolio managers of which were also stock-pickers, with 80.8% and 79.4% of long-term AUM, respectively, held in funds that performed above the average. But stock-picking didn’t always yield strong results last year. The funds of Franklin Templeton Investments Corp. and Invesco Canada Ltd. struggled, with only 34.7% and 20.1% of long-term AUM, respectively, held in funds that performed above the average. Nor was stock-picking the only answer. Dynamic Funds‘ and Scotia Asset Management LP‘s funds also did well: Dynamic ranked No. 2, at 82.6%, and Scotia AM at No. 5, at 78.6%. Both families offer a variety of investment styles. 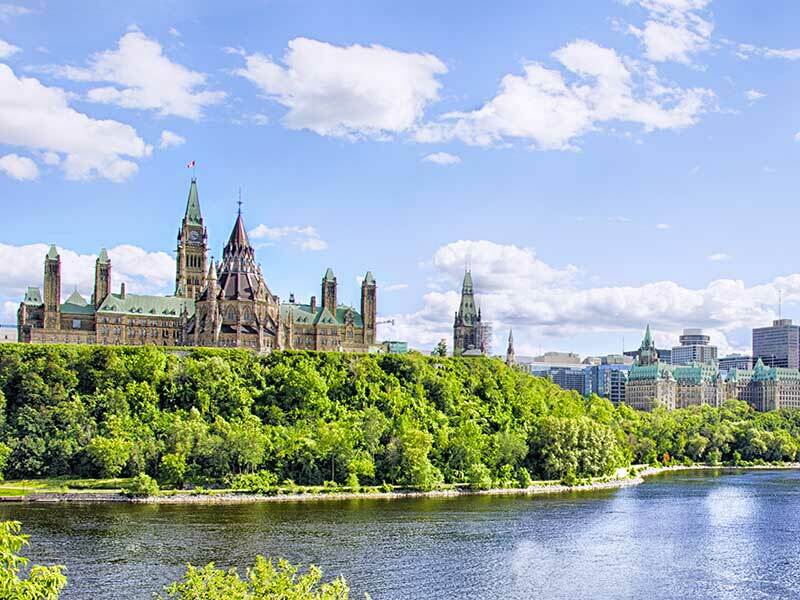 Glen Gowland, executive vice president, global wealth management, at Bank of Nova Scotia, which owns both fund families, attributes the strong performance to experienced portfolio managers who made the right adjustments in the last quarter of 2018. – MAWER INVESTMENT MANAGEMENT LTD. Moroz isn’t worried about how the external environment develops: “What matters is finding companies producing earnings and dividends.” He points to two “boring” stocks, which most people haven’t heard about, that did very well in 2018. 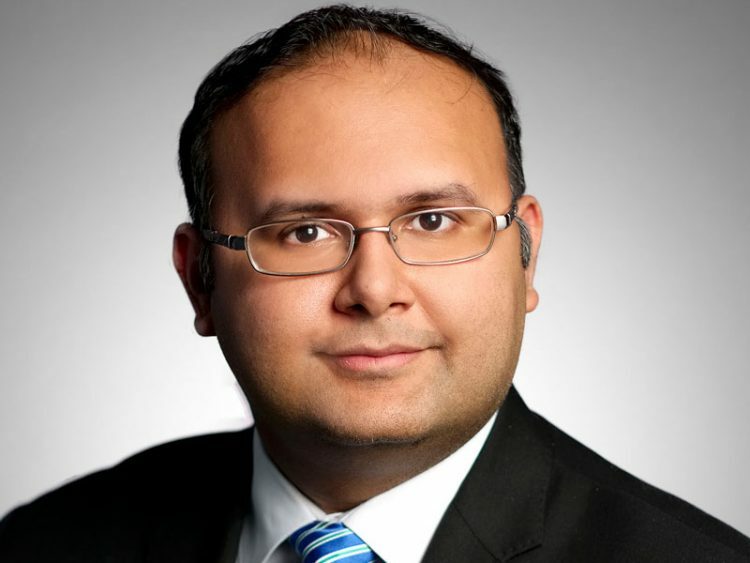 U.K.-based Aon PLC is an insurance brokerage and human resources services company that helps businesses with insurance needs manage risk in an increasing risky world, says Moroz. The stock’s return was a little more than 20% in 2018. – DYNAMIC FUNDS AND SCOTIA ASSET MANAGEMENT. Although both these fund families are owned by Scotiabank, they are separate families that use the same investment-management firm, 1832 Asset Management LP, which also is owned by Scotiabank. Dynamic’s and Scotia’s funds are similar yet different. Gowland says mandates can differ, with Scotia’s funds generally being a little more defensive and usually with less concentrated holdings. As a result, Scotia’s funds tend to have more consistent returns. 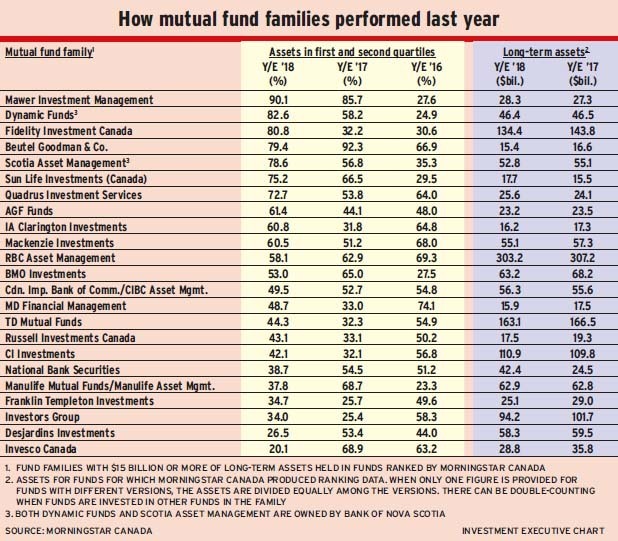 For example, in the past five years, Scotia’s fund family had four years with at least 55% of long-term AUM held in above-average performing funds, while Dynamic’s family had only three years of performance above 55%. The average percentage of AUM held in funds that ranked in the first or second quartile for Scotia’s family in 2014-18 is 62.4% vs Dynamic’s 52.6%. Still, according to Gowland, Dynamic funds’ ability to hold “meaningful positions” in more concentrated portfolios means that when the family is doing well, it usually has a higher percentage of AUM held in the first or second quartile, as was the case in 2018. There are critical questions, Gowland says. For example, were equities oversold this past December, or will 2018’s fourth quarter be the norm from here on out? If equities continue to rise, albeit likely with more volatility, both Dynamic’s and Scotia’s funds are well positioned. When volatility is low, there aren’t a lot of opportunities to pick up good-quality stocks at attractive valuations. Some Fidelity portfolio managers also were very defensive last year. The combination left fund returns lower than those of many competitors. But once volatility returned late last year, so did opportunities. Creelman says the firm’s portfolio managers bought a lot of equities in December on days of extreme volatility, and she’s seeing the result in returns already. Creelman thinks there will be even more opportunities in 2019 because increased concerns about potential risks in the market are feeding volatility. – BEUTEL GOODMAN & CO. LTD. This company looks for equities with quality underlying businesses for which financial markets have low expectations, says Mark Thomson, chairman and managing director for Canadian and global equities. Picks that did well in 2018 include Rogers Communications Inc. and Metro Inc. in Canada; Eli Lilly & Co. and AutoZone Inc. in the U.S.; and Horizon Pharma PLC in Ireland. Going into 2019, Thomson likes consumer staples firms, which have good businesses and low valuations. He also notes that valuations of financial services firms are pricing in a dire economic environment, so these stocks could be of good value. He adds that Beutel’s funds should “significantly outperform if markets are weak in 2019” because of Beutel porfolio managers’ discipline in buying equities when they are underpriced. – FRANKLIN TEMPLETON INVESTMENTS CORP. Like Fidelity’s, Franklin Templeton’s fund family benefits from volatility, “When volatility falls, so does our relative performance,” says Duane Green, chairman, president and CEO. Although that didn’t show up in the family’s performance for 2018 as a whole, Green says, 66% of their AUM were held in funds in the first or second quartile in the fourth quarter. Green thinks 2019 will be a “fairly constructive year of financial markets, with growth continuing.” He likes equities over bonds and emerging markets over developed markets. 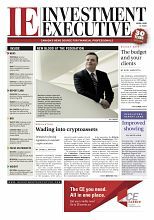 – INVESCO CANADA LTD. “Invesco’s holdings of undervalued, quality companies with good long-term prospects weren’t rewarded in 2018,” says Jamie Kingston, senior vice president of North American product management and development. Kingston says the first half of 2018 was dominated by high-growth companies and momentum plays while the second half of the year was dominated by slower-growth, defensive stocks, such as utilities and consumer staples. Invesco portfolio managers generally don’t invest in these areas. The firm’s Canadian equity funds were “clobbered” by their holdings of primary energy producers rather than more defensive energy holdings, such as pipelines. As well, fixed-income funds were hurt by an over-weighting in corporate bonds in a rising interest rate environment and the financial market turmoil at yearend. Kingston thinks 2019 will be a better year for Invesco’s fund family. He anticipates better commodities prices to help energy holdings and also thinks emerging markets, where valuations are low, should do better than last year.